Since 2012 is the 100th anniversary of the sinking of the RMS Titanic, we’re seeing a plethora of books about the historic ship and its voyage. Everyone knows how the story ends, so it takes something special to make a Titanic book stand out. Allan Wolf has written that special book – The Watch That Ends the Night: Voices from the Titanic. Written in verse, The Watch That Ends the Night is told from multiple points of view – the captain, the shipbuilder, passengers, crew, the ship rat, the undertaker, and even the iceberg. The characters are all real people; most of their actions on the journey are imagined. The people on board start the trip in high spirits – it’s exciting to be on board the biggest, most luxurious ship in the world – even joking about the Titanic sinking. As their journey progresses, readers learn the characters’ backgrounds and get a feel for their personalities and they become so much more than another passenger. They put a face on all the passengers on that ill fated voyage. Wolf does a great job of including male and female characters of different ages and social classes, capturing their emotions and dreams. I became attached to quite a few of the characters and kept hoping they’d manage to survive. Wolf did extensive research for this book and it shows. He includes notes, miscellany, and a lengthy bibliography. He also fills in details and the fate of all the characters in the book. I don’t read a lot of historical fiction, so the fact that I thought The Watch That Ends the Night was fantastic should give you an idea of just how good this book is. It’s written for the young adult market but adults will enjoy it too. If you only read one Titanic book this year, make it this one. I read this book for the 2012 National Poetry Month Blog Tour on Savvy Verse & Wit. According to wikipedia, “A verse novel is a type of narrative poetry in which a novel-length narrative is told through the medium of poetry rather than prose. Either simple or complex stanzaic verse-forms may be used, but there will usually be a large cast, multiple voices, dialogue, narration, description, and action in a novelistic manner.” If you’re nervous about trying poetry, a novel in verse is a great place to start. Kathy, this sounds like a great book for adults and kids. I like that you included a definition of novel in verse. 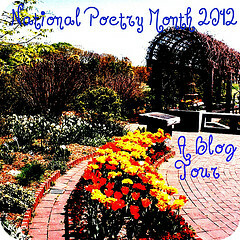 Very nice touch and thanks for participating in the NPM Blog Tour! I really really REALLY want to read this! I have it, but just haven’t been able to find time to read it. He was also at the UCF Book Festival (I didn’t hear him speak at SIBA) and he so inspired me. He is a clever guy, kind of an eccentric genius even. This one is very high on my list. I haven’t read a novel written in verse or about the Titanic. This sounds like a good read. Like Sandy said, we got the chance to hear him speak at the UCF Book Festival, and I was so excited about the book after hearing him talk about how it came to be and the unique way the story was told. He even showed us and explained about the way the graphics were arranged on the page. This book is on my “must read” list, and I am so glad that you enjoyed it. Very nice review today, my friend! Great selection to read at this particular time. I love stories about the Titanic! Sounds like a great find! Sounds marvelous and SO up my alley. I’ve been Titanic obsessed since I was super young (way before the movie). Oh wow. This sounds amazing. Thank you for the great review. This sounds fantastic. I’m interested in the Titanic and love books written in verse. Glad you were able to find some poetry you enjoyed. This sounds fantastic, anything Titanic related really fascinates me. This one sounds unique. Oh I’ve been really looking forward to reading this book. I think Titanic stories are so interesting, and the fact that this one is written in verse really appeals to me. Glad to hear you enjoyed it even though it’s not your usual cup of tea. I really need to track this one down. This has been on my radar but I haven’t yet tracked down a copy. I’m fascinated (like everyone else) with the Titanic. This book sounds amazing. Love the idea that it’s historical fiction written in verse. This one sounds great and I love the fact that he really did his research! Sounds amazing! I tend to shy away from books about the Titanic for some reason, but this one looks worth the effort. I am definitely looking forward to this one now! It’s hard not to be completely fascinated by these events. Thanks for putting this one on the radar! To tell you the truth, I avoid stories like this – the ones where I know it’s going to tragic at the end. I cry just watching the trailer for the movie. I can’t imagine what I’d do for a whole book or the whole movie. What a fantastic review, Kathy! I have never read a book in verse and don’t know if I’d like it but after this review I’m sold. Will definitely add this one to my TBR list. I’ve noticed that there are quite a few new books on Titanic but this one does sound unique. High praise, Kathy. I’ll watch for it. I love it when authors fill in the details about the fates of all of the characters. I’ve only read one novel in verse before, but it was great, so I’m definitely willing to try another one. I get tired of reading about the Titanic, but a verse novel is different enough to tempt me into it. sounds incredible! i haven’t read that much about the titanic and htis might be a great place to start. oh this one sounds really interesting! i keep seeing commercials for the new titanic movie being released and didn’t even think about reading books about it. i’ll have to keep this one in mind if i do decide to read a titanic book. I heard Allan and his son Simon recite selections from this at Flyleaf Books in Chapel Hill. It was so great I bought the book and read it nightly to my eight year old son! I highly recommend it! I loved hearing him speak at the UCF Book Festival, he was fascinating! I really wanted to read the book after hearing him speak and yours is the first review I’ve seen. I trust your judgment on this one and now I want to read it even more!! The novel in verse thing keeps popping up on my reader but it really is hard for me to imagine liking it. I guess I’ll just have to break down and try one at some point! You certainly make this one sound appealing! This sounds both unusual and cool. Thanks for bringing it to my attention! I love stories told through prose, and even though I’m not a huge fan of Titanic books, I may have to take a look at this one. Thanks for the review. This sounds interesting & kind of reminds me of Vikrem Seth’s The Golden Gate, which is also a verse novel. thanks for sharing this. This sounds like a really interesting and different way to tell a story about the event, thanks for bringing it to my attention. This most definitely sounds like a book I would like! I love all things Titanic. You seem to find the most fun books in verse, Kathy. The TItanic is so fascinating because of the hugeness of the catastrophe and the endless invididual stories of the passengers. I just started this book, based on your review. Absolutely fantastic! Loving it!